A Wednesday Aug. 24 overnight flight of the NASA Global Hawk hurricane drone measured 75 mph winds, thus, Hurricane Gaston became the third hurricane of the 2016 Atlantic hurricane season. Weather.com reported that despite this upgrade, Gaston has a somewhat complicated future ahead, but it is not expected to impact the Yucatan Peninsula. 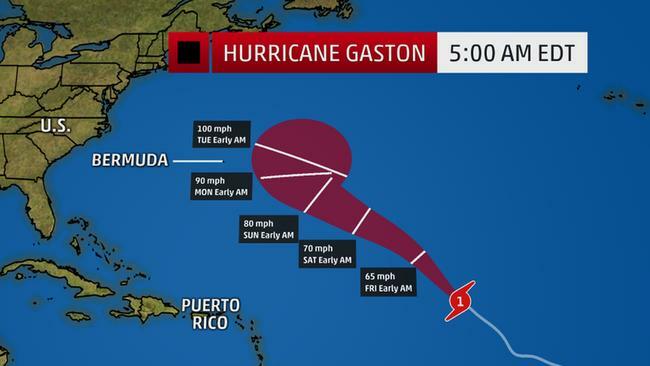 Gaston was centered just over 1,200 miles east of the Leeward Islands, as of Thursday morning, and was moving northwest at about 17 mph. In general, the atmospheric steering pattern in the Atlantic Ocean suggests Gaston will continue to be drawn northwest into the central Atlantic Ocean. It is most likely Gaston’s center will remain east of Bermuda as it approaches that latitude by early next week. However, it is still a uncertain how close Gaston will come to Bermuda before making its final sharp northeast turn into the North Atlantic. Interests in Bermuda should continue to monitor the progress of Gaston. Gaston is now subject to increasing west to southwesterly wind shear, which may induce some weakening of the cyclone through Friday. This wind shear is expected to slacken by the weekend, allowing Gaston to regain strength before it eventually gets pulled northeast into the north Atlantic by the jet stream. Meanwhile, Tropical Storm Lester became the 12th named storm of the eastern Pacific hurricane season early Thursday, but it was well southwest of Mexico in the Pacific Ocean and not expected to directly impact Yucatan. We’re now headed into, climatologically, the most active time of the Atlantic hurricane season. Typical tropical storm and hurricane origin areas and tracks in August. This is **not** a forecast for this current system, merely a representation of August climatology. This time of year, tropical waves, also known as African easterly waves, line up over Africa south of the Sahara Desert and emerge into the eastern Atlantic Ocean. A fraction of these tropical waves serve as the seed for an Atlantic Basin tropical storm or hurricane each season. Regardless of whether either system becomes a threat, now is a good time to make sure you have a plan before a hurricane hits.